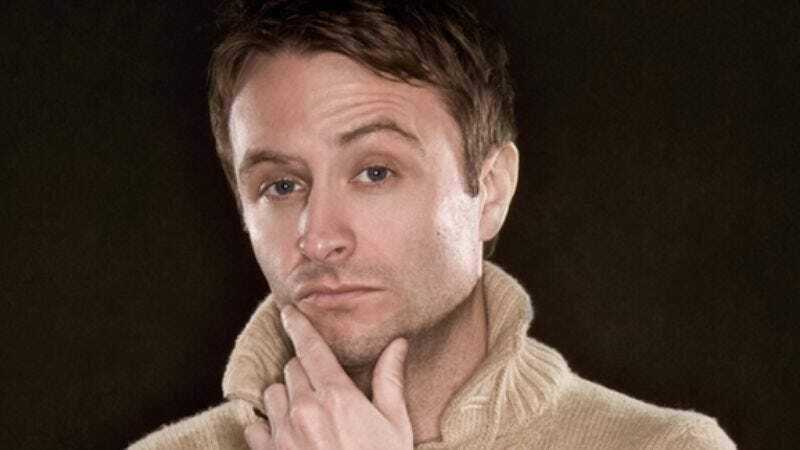 Chris Hardwick looks like he could be a poseur. The comedian and actor behind Nerdist.com (and @nerdist) and the weekly Nerdist podcast is handsome and gregarious, two qualities missing from the nerd archetype. In a world where nerd-dom is no longer a stigma, Hardwick has frequently been asked to prove his geeky bona fides. He contributes to Wired, does product reviews for G4’s Attack Of The Show, and spent his adolescence ensconced in extracurriculars like Latin Club. He also had a regular Dungeons & Dragons game with comedians Brian Posehn, Patton Oswalt, and Blaine Capatch a few years ago. (“I played Neutral Good Wizard, Patton was a drunken dwarf who would spontaneously burst into song, and Posehn was a ninja who loved pickles,” Hardwick says.) He’s legit—and very busy. He’s writing a Nerdist book, shooting pilots, gearing up for the return in March of Web Soup (G4’s spinoff of popular E! clip program The Soup), doing stand-up, and occasionally performing with Mike Phirman in their musical comedy duo Hard & Phirm. As part of our year’s best podcasts coverage—the Nerdist podcast is one of the best out there—The A.V. Club spoke with Hardwick during downtime for his fourth pilot this year to talk about podcasting, how it affects his comedy, and how nerds are the new drug dealers. The A.V. Club: You came to podcasting after a pilot didn’t get picked up. What does podcasting fulfill for you? Chris Hardwick: I’d been working on this pilot for a while. It was gonna be one of those shows that I think would have kicked everything with my work up a notch, in terms of visibility and the regularity—this was gonna be a daily show. For me, ultimately everything is about being visible, to get people to come out to live shows. All the work stuff hopefully trickles into the rain gutter of getting people into the live shows. So I found out in mid-January, after like five months, when we thought the show was gonna go, they said, “Eh, your show is in fact not going anywhere. At all.” I really took it hard for a couple of days, and I normally don’t because I’ve been doing this for a long time, and I know how this works. Most stuff doesn’t go. It got really under my skin. So for two days I was really bummed out and really pissed off at the entertainment business in general. I don’t know who I was mad out, but if there was a President Of Entertainment, I would have seen that guy or lady. I had been thinking for a good year that I wanted to do a podcast, but I kept thinking, “Oh it’s gotta be a thing. It’s gotta be produced. I don’t know if there’s gonna be sketches, or segments.” I kept thinking it had to be a really finely tuned television show, but for audio only. This sort of kicked me into the mindset—I was literally in the shower after two days. I wasn’t in the shower for two days straight. [Laughs.] Something just kicked in where I thought, “Oh wait a minute, I’m just gonna do a podcast because it’s mine, I can control it, I have complete responsibility over it, and no one can touch it.” And that’s what I did. I went out and bought the equipment that afternoon—that was on a Thursday. Sunday we recorded the podcast, Monday I put it up, and Tuesday I noticed people were listening to it. Everything in the entertainment business takes so friggin’ long. It’s always one of the many reasons why I love stand-up so much, because when you’re performing, you get instant feedback. You know if stuff is working right away—you can just perform if you want to. Television and movies just take so long. If you pitch a show or develop a project, it can be a year before your show even gets on the air, if it gets picked up. Just the concept of “I had this idea” and within a week it was in the world, that also was another part of why it felt weirdly empowering as a performer. Like, “Oh I can just make it big and no one can stop me.” It almost felt like a bratty kid, “You can’t stop me now!” So that’s what I did, and I guess I just assumed like, look, I don’t know if anyone will listen to it, but consistency is really important, so I guess we’ll just commit to putting up at least an episode a week, as long as we have people that are willing to come on. We’ve managed to do that for almost a year now. Honestly, I think doing the podcast may have been one of the best career decisions I’ve ever made in my life. AVC: A good example of that is Doug Benson. At some of his stand-up shows now, people want to play the games he does on Doug Loves Movies. He can have additional Doug Loves Movies shows on top of stand-up dates. CH: Which is great. I’ve done a bunch of those, and they’re incredibly fun. Attendance of those went up. Podcasts are the new comedy albums, in my opinion. AVC: Has anything from the podcast leaked over into your stand-up act? It’s part of the reason why I do lots of crowd work in my set, because I enjoy writing material through riffing and conversation. But I’ve recorded so many stand-up sets that I’ve never gone back and listened to, even though I know I need to be writing new stuff. So that part of the process, of combing through it and panning for all the nuggets—I just haven’t done that yet, and now that we’re 50 episodes in, it feels like too much of a daunting task. AVC: Does the podcast cannibalize doing an album to a certain extent? CH: It’s interesting you ask that, because I’ve done a lot of stand-up on the podcast when we do the live shows. The other night, our last episode of the year, is gonna be a “Young Comedians Special” is the best way to describe it—it’s really a “Comedians People Should Know Special.” Because I was really influenced by Rodney Dangerfield’s specials in the ’80s, when comedy was on every channel, and they had tons of young-comedian specials all the time. That’s how I was exposed to a lot of new comedy, and so I thought, “Oh my gosh, we should do a special—friends that I know who have comedy albums, just to help them promote their stuff. People should know who they are.” We did it at Meltdown Comics last Wednesday—Chris Fairbanks, Jackie Kashian, Kyle Kinane, Matt Braunger, a guy named Paul Cibis, and Jonah Ray did stand-up. It was incredible. The place was full, everyone killed, and so I’m really excited to put that up. But the point is, I’ve done a lot of stand-up through the live version of the podcast that we’ve done, and I am kind of nervous because I do want to do a special next year, but I’ve done so much material on the podcast, so should I not do any of that now? Or should I just force myself to write a new hour? I don’t know. AVC: Your stand-up act has changed quite a bit in the past couple years. You were doing a lot of L.A.-based material, but have moved away from that. CH: Yeah, going on the road breaks that habit real fast, because in Cincinnati they don’t care about how weird auditions are. [Laughs.] It’s just so far outside the scope of their reality, so you kinda make compromises. There are so many different schools of thought. Louis C.K. always used to say, “It’s your job as a comic to do well in a room regardless of who’s in it.” And Paul F. Tompkins would say, “No, you should just perform for the people you want to perform for. You don’t have to go in every room.” And Patton had this old thing where he would say “One joke for me, one joke for the crowd.” He would go back and forth. So I started trying to find stuff that worked in both places. But in the last couple years, working at G4 and then the blog and the podcast, and the more nerdy stuff I was involved in—I would love to see an animated concentration map of the last two years to have different demographics represented in different dot colors so you could watch one overtake the other. Early on it was mostly rednecks and a handful of nerds who watched G4. Then it was sort of a weird audience pong of “Joke for the nerds, jokes for the hicks, jokes for the nerds, jokes for the hicks.” Now it’s getting a lot better for me because people are coming to shows and they know what they’re coming to see. I don’t really have to convince the audience up top. I don’t have to say, “Here’s who I am, and here’s why it’s okay to like me! You’re safe, everything’s safe. It’s all fine.” It really does make a difference, and the podcast has helped tremendously with that. CH: It really is a different kind of performing, in my opinion anyway, because the shows I’ve done at Comic-Con are just incredible, because it’s right in the heart of people that I would hang out with. Someone might say, “Oh that just makes it easier. You’re cheating.” Comedy has to be some weird steeplechase where you have to go in and cut the red wire at the right time. I feel like it’s a better experience when people know what they’re there to see, and you can really speak to them and connect with them. For me, stand-up is a conversation in a sense like, “Hey we’re going to establish a relationship.” Like if you’re kind of a nerdy dude, and you show up in a party with Ed Hardy douchebags, you could make it work, but it’s not as fun for you. It’s more fun to go to parties where you have things in common with people, and you can talk about things that you all like in common and you can learn new stuff. That to me is just more of a fun experience. AVC: Were there any podcasts you had listened to that you were trying to emulate at the beginning? Part of it was sort of a lazy decision, because I knew that to do an episode a week, I had to take as little time as possible away from the work I was actually getting paid to do. I love the format because it’s fun and organic, but it’s also the easiest format. [Laughs.] Like The Pod F. Tompkast, which is also phenomenal because Paul F. Tompkins is one of the most brilliant performers in the world, that’s more produced, and there are more segments, but that would be tough to do as a weekly show. I don’t really edit the podcast at all. We tack on the intro and an outro, and sometimes I’ll mention show dates at the top, but even just doing that that takes an hour. You have to drag the file out, upload into iTunes, export it as an AIF, even out the levels, re-import it and tag the stuff on, and post it and put the picture on and write the description. It always takes twice as long as you think it’s gonna take. To actually produce a program just takes hours and hours and hours. That would be tough to do on a weekly basis, so my invisible hat’s off to Paul F. Tompkins. As a comedy nerd, I get a lot out of the podcast because I’m genuinely interested in the people I’m talking to. I’m fascinated by people’s process. Everyone’s process is a little bit different, and just to see the different paths that people take to get where they are is really interesting to me. So it’s still really, really fun. AVC: Do you think enthusiasm is the key thing for making good podcasts? CH: I think some of what makes it a good podcast is that it’s organic. It doesn’t feel forced. If we can say anything about ours, it’s that we’re not faking it at all. We’re genuinely interested in the people that we’re talking to. They’re not all comics. I sort of realized quickly that there are only so many comics in the world. [Laughs.] Number two, talking to someone who’s an actor or someone who’s a musician, they’re all different flavors of the creative process, so we opened it up pretty quickly to non-comedians. But hopefully people take away that it’s organic because we genuinely care about it. Every time we finish a record, it’s sort of feels like, “I can’t believe that we’re hanging out and having a conversation, and people are gonna listen to this.” It’s an odd thing, but it’s really cool. AVC: Nerdist gets like 100,000 downloads, right? CH: Yeah, we do about 100,000 per episode. I’m pretty sure Corolla’s [downloads] are a lot higher than that. The funny thing is, no one really talks about their numbers, and I’m not sure why. AVC: When we interviewed Scott Aukerman, he was elusive. AVC: So is there a way to make money off of that? CH: We’ve all been talking about it, all of us in the comedy-podcast club. [Laughs.] Everyone’s got their different methods. I think [Marc] Maron does his donation system, Pardo has the premium subscription-based model. They’re all great, and I think Aukerman with his podcast network is really smart. We’ve tried doing some ads every once in a while, and we’ve made some money doing it. That wasn’t really my goal in the beginning; I wanted it to be free. I wanted as many people to hear it as possible, so people would come to the live shows. When you start the premium model, that’s gonna cut your audience by a lot, because it’s the digital age and most people don’t want to pay for things. I felt that it was more important to keep it free but have it hopefully be distributed more. I don’t think Pardo wants to tour that much anymore, so I think he’s doing really well with his subscription-based model. I think a lot of it just has to do with why you do it. For me it’s because I like it and because it will hopefully help with the live shows. We are talking to people about sponsoring more podcasts, because at a certain point, after a year, it does take a little bit of work. We should try to make a little bit of money for it so we can prioritize it over things we actually get paid to do. It does get hard to justify it. For instance, Jonah was writing on a show, and trying to convince him, “Yeah you got to leave work for no money for a couple hours.” [Laughs.] It’s just hard to justify that. So I guess we’re in the process of figuring it out now. I have some ideas that we’ll experiment with and see if it works, but it will be a sponsor-based model. I don’t ever want people to have to pay for the audio podcast. AVC: Switching gears, you have a book coming out next year. It’s a sort of guidebook, right? CH: It’s based on an article I wrote for Wired a couple years ago. It was a first-person account about how I took three time-management programs and implemented them. It was a lot of fun, so I just thought, “I think I might be able to blow this out and feature it as a book,” because I made a lot of changes in my life between my twenties and thirties, and it all sort of revolves around how I think people with nerdier brains tend to problem-solve and approach things differently then “norms.” It’s sort of like a productivity-management book for nerds, I guess is the best way to describe it. I’m obviously not an expert with a degree. I’m just a dude who made some changes in his life, so it’s a bit autobiographical from that standpoint. AVC: What’s the tone of it? I can’t imagine it’s too Tony Robbins-esque. CH: It’s not at all. It’s just sort of very snarky. In my mind, I categorize nerds as creative-obsessive. A lot of nerds are creative people who obsess almost unnaturally over the minutiae of things. So it’s saying, “You have this laser-like brain, but it’s not always focused on the most productive things. If you want to play Halo: Reach all day, that’s fine, but if you want to accomplish some other things, here are some ways to do that using your innate nerd gifts.” I almost think of nerd brains as rattlesnake venom; like, you can milk it. You can milk the pulpy venom out of the nerd brain and use it for good if you want to. I also think that a lot of nerds, because I think they tend to be obsessive and hyper-aware, there’s a large part of the book that plays into how we tend to be more anxious as humans, anxiety and depression and things like that. It’s navigating those waters and trying to maintain a level of productivity that you’re happy with. AVC: The whole concept of nerd empowerment is a recent development. My sister is concerned that her 11-year-old is too nerdy, and I was trying to explain to her that it’s not the same stigma from 20, 25 years ago. When there’s a scene in The Social Network where Jesse Eisenberg is getting blown by a social-media groupie, you know things have changed. CH: First of all, I love the idea that someone’s like, “There is not gonna be a nerd in my goddamn house!” That’s really funny. But I get this question a lot because I think people have this stereotypical idea in their head of what a nerd is. People have said to me before, “You’re not a nerd!” because I think they think of the classic Revenge Of The Nerds archetype. I feel like it’s not about the superficial quality; it’s about how nerds approach life. It’s much more emotional and mental than it is you’re some fat guy living in your mom’s basement, which I think is just a hacky stereotype. But when I was growing up, I was as socially outcast as any nerd could possibly be. I was in the chess club, I brought D&D stuff to school, I had every game system you could imagine, I spent countless hours at arcades, computer camp, loud presence in the Latin Club. All that stuff.